Let me start off by saying I love my Aimpoint Micro-T1 red dot optic. That thing is one of the best pieces of glass I have ever used. That Aimpoint optic is built like a tank while being light as a feather. I absolutely love it! But this article isn’t about my T1, it is about the Konus Sightpro 7216. But I had to start off the article referencing the Aimpoint. Wihtout owning and loving the Aimpoint I would have never bought the Konus. Do I have you total confused yet? I hope not. Well, actually, I do…just a little bit. great deal to start off with. Now let me make this really simple…the Konus is no Aimpoint. Come on…you already knew that was coming. The price alone would tell you that. 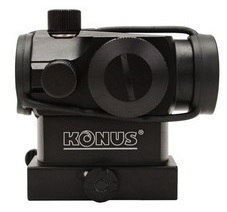 The Konus is at least 1/5th – 1/9th the price of an Aimpoint. 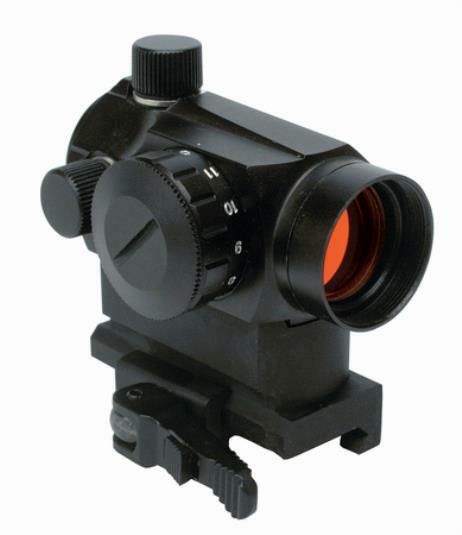 You already knew that a $80 optic isn’t going to equal a $750 optic (with base and riser). That is a no brainer for sure. But, that being said I like the Konus. I think it is a very viable entry level red dot optic. It is lightweight, rugged, and the glass is pretty good all things considered. No, it doesn’t have multiple nigh vision settings but do you honestly have night vision to shoot it with? And no, I wouldn’t submerge it like you can an Aimpoint. But, are you really going to go all SEAL on me in the field? There is no positive stop on the brightness knob. There are markings; “0” for off and 1 – 11 for the brightness settings. But, the knob will just keep going right past the “off” setting. Not really a big deal, just look at the knob and set it to “0” when you want it off. The windage and elevation knobs were clearly marked and worked like you would expect them to. The protective caps actually had a very decent quality feel to them. They snugged up nicely to a rubber “O” ring at the base of the threads ensuring that water and dirt would not enter the optic. But, like any “O” ring, they will eventually need replacing…so buy extras. The protective rubber lens covers looked and felt exactly like the Aimpoint counterpart. But, rubber is rubber. The quick-release lever was not fun at first. The little locking lever on the release lever that actually unlocks the release lever to function is small for my big fingers. It was also really tight at first, making unlocking it a bit of a pain. But, I would rather be a little difficult to unlock than sloppy. The first time I installed it on a rail I had a heck of a time getting it to release to take it back off. Oooooppppsssss…my bad! The locking lever isn’t made to “depress,” it is made to “slide” back away from the pin and then the quick release level moves without any problem. That little tidbit of information isn’t in the instructions. When I got it on the rail it was a really sloppy fit. But, using the quick-release adjustment screw on one side, and pushing the on the locking lever, I was able to adjust it to the proper fit. I locked it in place on the rail and it was a solid tight fit. 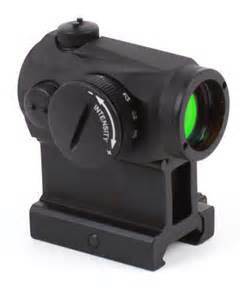 Sighting it in is just like any other red dot optic, windage and elevation. At 100 yards each “click” moves the dot 1/2″. The adjustment screws are clearly marked and easy to work with. The adjustment screws have a high-quality feel to them as they turn, and they have a distinctive “click” as you pass each 1/2″ adjustment. The red dot itself is crisp and clear. My eyes are not what they use to be, but I started checking the quality of the dot at the “1” setting, it was nice and dim, but the dot was clearly visible and the edges were not blurry at all. At “5” I started to see the starburst effect around the red dot, but you will get that on any red dot that I have ever tested…including my high dollar Aimpoint. But, it really doesn’t affect the sight picture. When you have to use the high brightness setting you are outside in full sun and the starburst effect is almost invisible. Here is my one negative…and it is a fairly small one. At the base of the windage and elevation knobs there is a sliver of shinny metal visible, maybe .7mm thick. Why is that an issue? Come on…think about it. I am a nutcase of tactics and life safety. For some weird reason I imagined a little light reflected off that sliver of metal and giving away your position. Yeah…that is the only negative I came up with. So, my OCD self could easily take a small artist brush and dab a little black paint on it…bingo, no more negatives. I read the reviews on Amazon and found some problems with some of the reviews so I put my two cents in there. I think the two bad reviews came from people who didn’t know what they were doing. You should see my response in there if you are interested. Now, I will tell you that I haven’t ran it on my AR-10, a shotgun, or punched hundreds of 5.56 rounds using the optic so I can’t verify that it will hold up to a sustained usage. But, based on everything I have seen about this little beauty, and some range time, I think it will be just fine! You can’t afford a $750+ Aimpoint Micro T1 with mount and riser. You will be using it for CQB since it only has a 1x magnification. 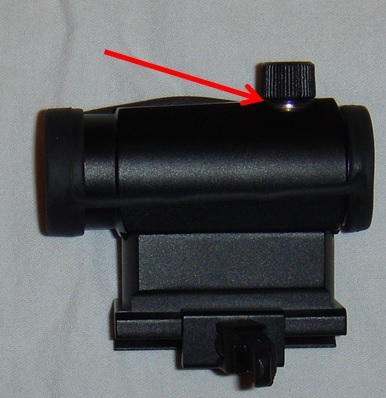 Or you will use a flip-away 3x magnifier if you are going beyond CQB. Nice little sight, I am glad I have it. I like it and I will use it!